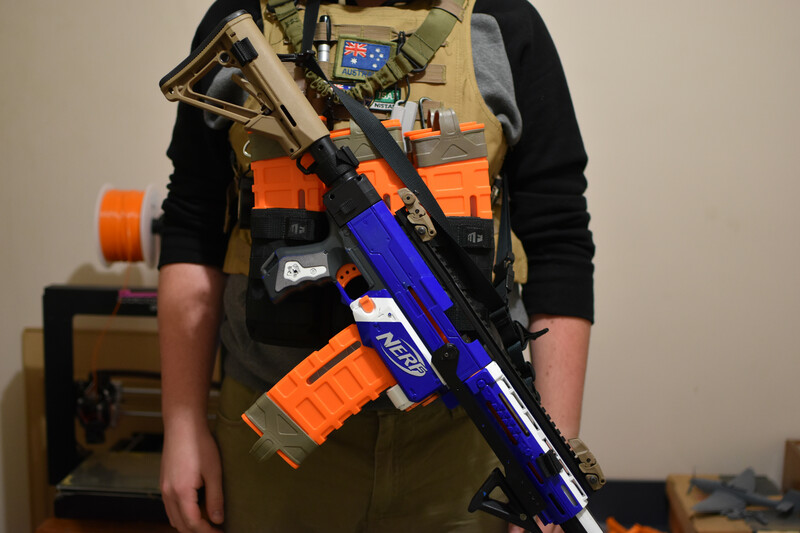 Slings are an important part of any Nerf battle load-out. 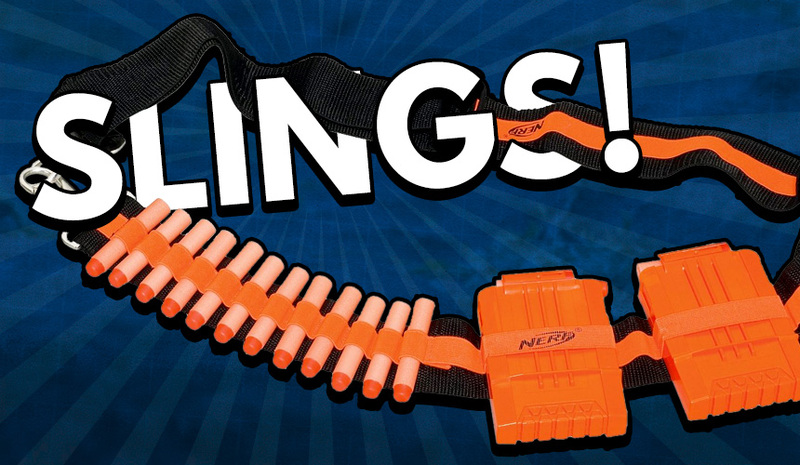 Whether it be tailored to long term games like HvZ, or short fast paced games, slings provide some very valuable services to the user. 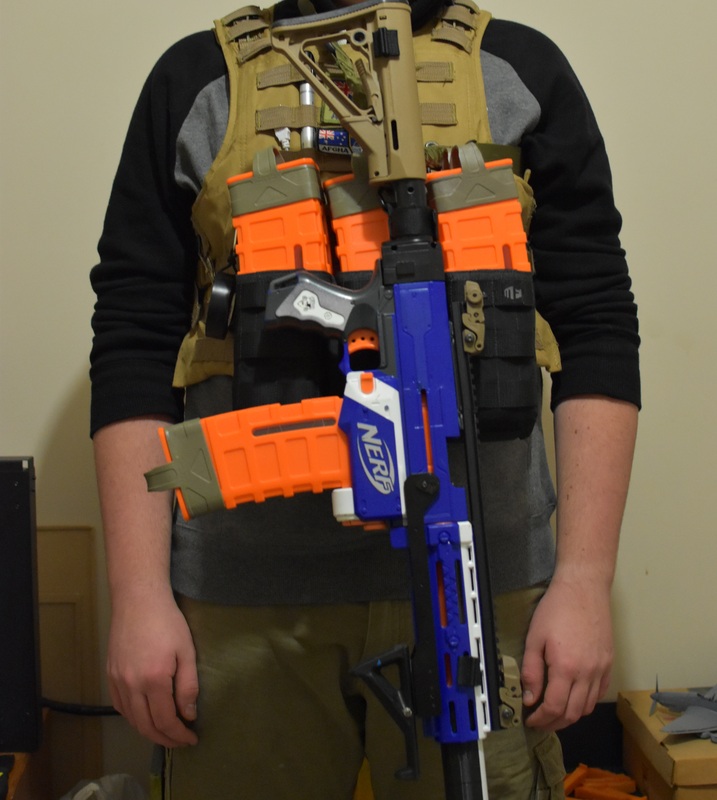 One obvious benefit to the user is the ability to rest their blaster against the sling without taking the entire weight in their hands (this isn’t a super important advantage, but it certainly provides a little quality of life benefit–especially for a longer HvZ style game). 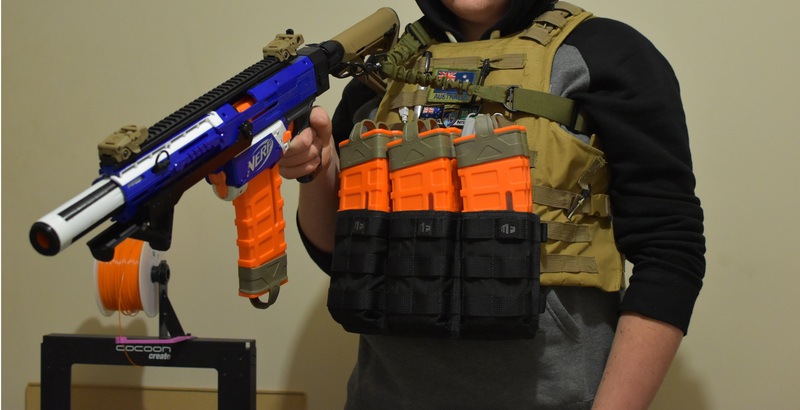 Slings also allow the user to drop their blaster and the sling will “catch” it. This leaves both their hands free for tasks like helping teammates, running objectives, or drawing a sidearm. This also saves any paintwork you may have from the cruel mistress that is the ground. But first, I’ll discuss mounting points for slings, which are just as important as the slings themselves. Certain slings ‘prefer’ different mounting points. And while the mounting points that are already on the blasters may suffice for some situations, I personally find them to be quite lacking in terms of ergonomics and placement. Below is what I use on my Retaliator. 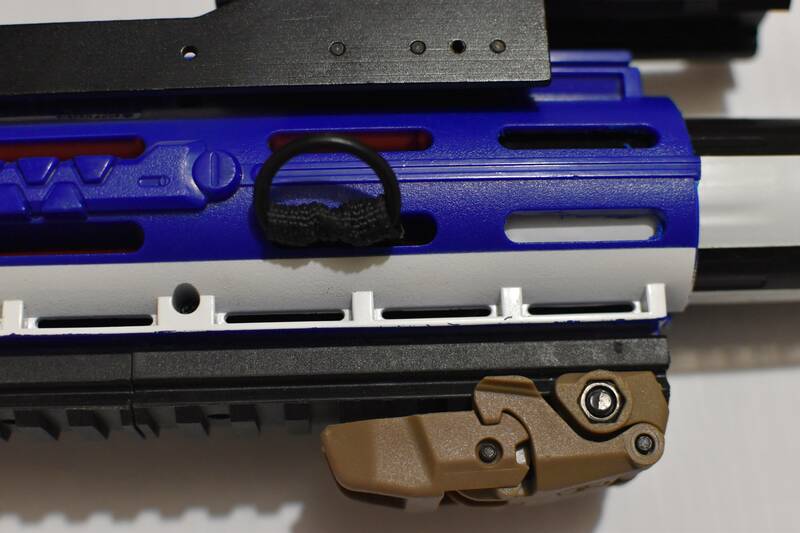 The stock is also used on a Stryfe, so the sling points there remain the same. This is the front point for the 3 Point sling I use. It could also be used for a 2 Point. 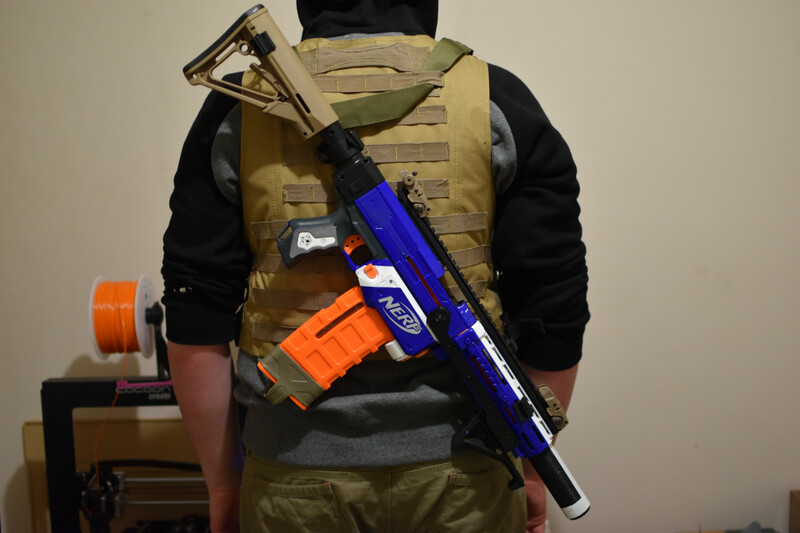 It is fed through the “Vents” on the Retaliator front barrel and is a tight squeeze to get through. But this also means it won’t partially or fully fall out during use. 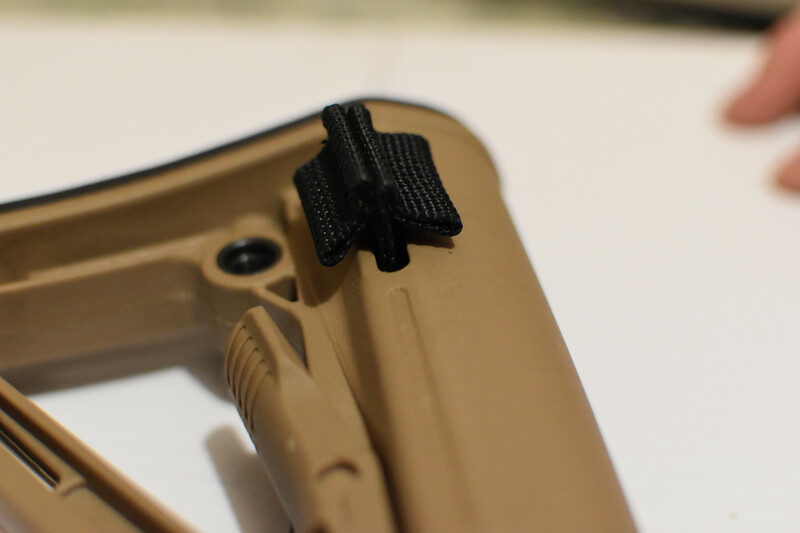 This is the rear pair of sling points. 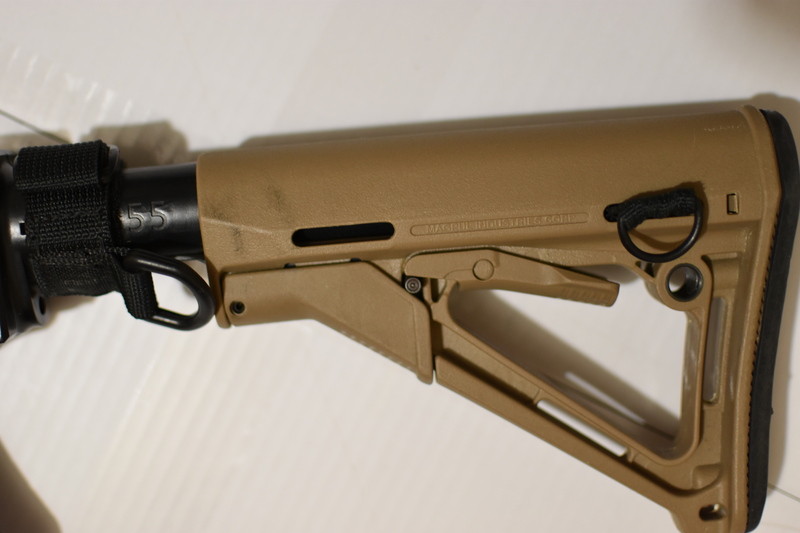 The one closer to the stock mounting point is used for Single Points, as you will see further on. The rear one is used for 2 and 3 Points and functions the same as the front one. There are several ways in which to utilize a Single Point sling. Here are the three most common uses. 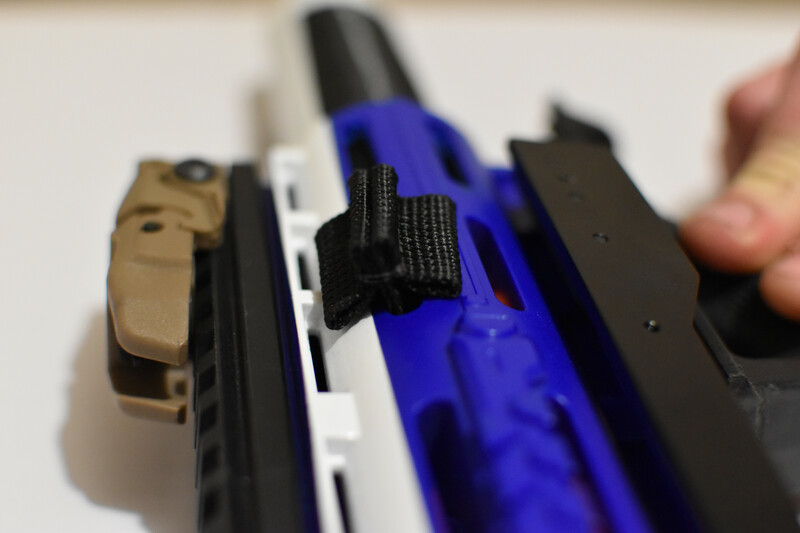 The Dominant Shoulder sling method allows the blaster to hang freely at the front of the user. It is ambidextrous, in that it can allow the user to shoulder the blaster on either their left or right shoulder. 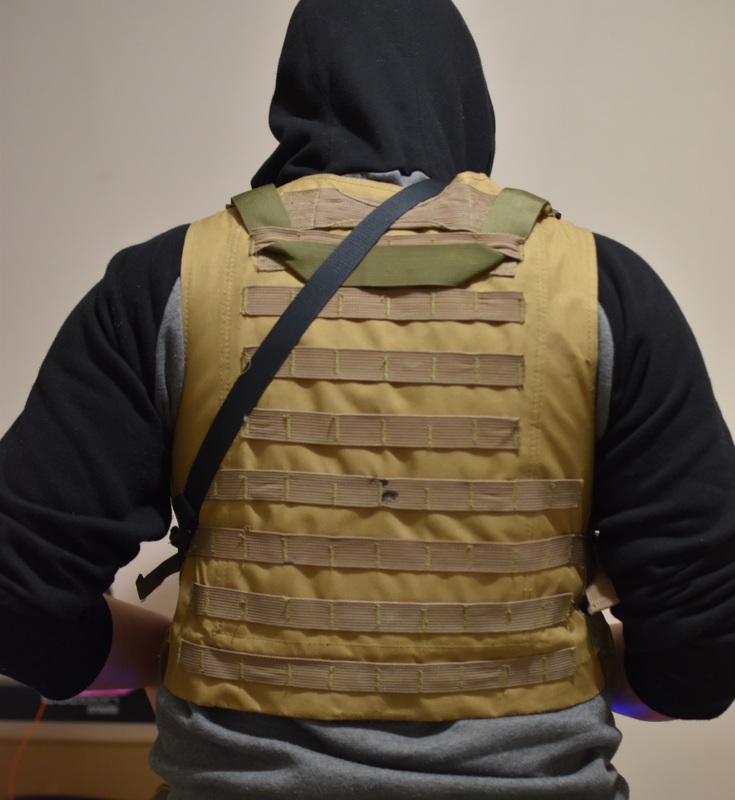 This sling method is useful, since the resting position is directly front and center, which makes transitions to a sidearm blaster very easy. It would be suitable if there was no major other tasks to perform like carrying larger items. The Off-hand Shoulder method is good for players that do not run a sidearm blaster in a hip or drop-leg holster. The resting position of the Off-hand Method would prevent the players ability to quickly draw a sidearm in such a position. However, I find the Off-hand Method good if the player intends to do other things while playing the game like eating, moving items around, using a tablet or phone, etc. The Over the Shoulder is my preferred Single Point sling method. It allows the blaster to sit centrally on the front. However, when using longer blasters like the Retaliator, a pendulum effect with the muzzle swinging is created, which isn’t desired at all. 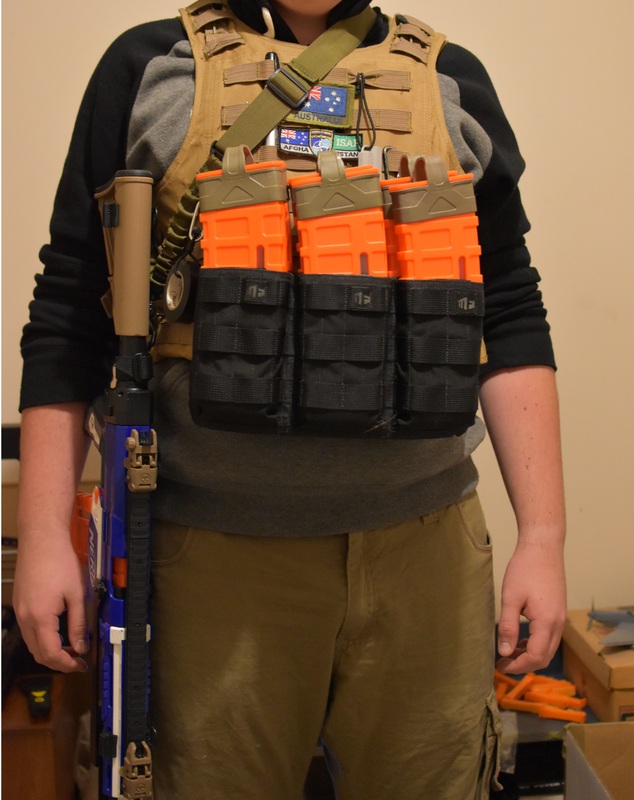 I use this sling method solely with a Stryfe, which does not have the pendulum issue due to its short length. Over the Shoulder like this has the advantage of always allowing the blaster to sit centrally. 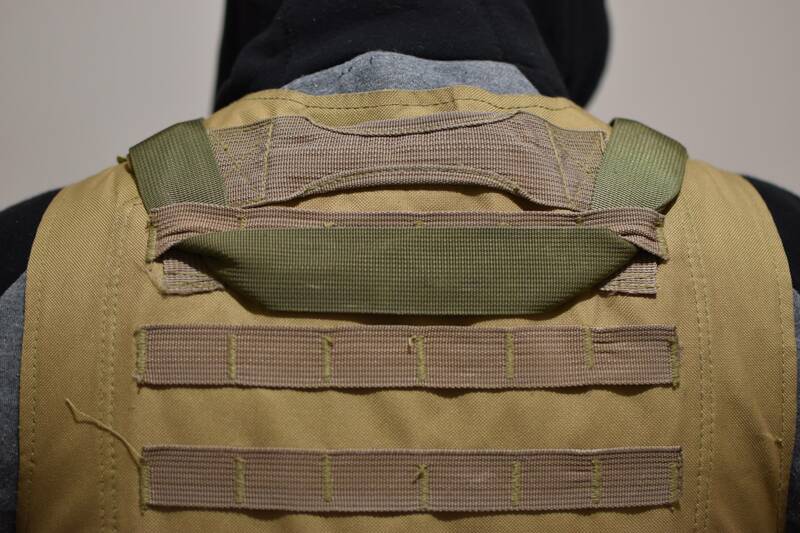 Because it’s woven into the plate carrier, it does not dig into your neck, which can be an issue with both of the other Single Point methods. This also means you can’t forget your sling–a small thing, but handy none the less. 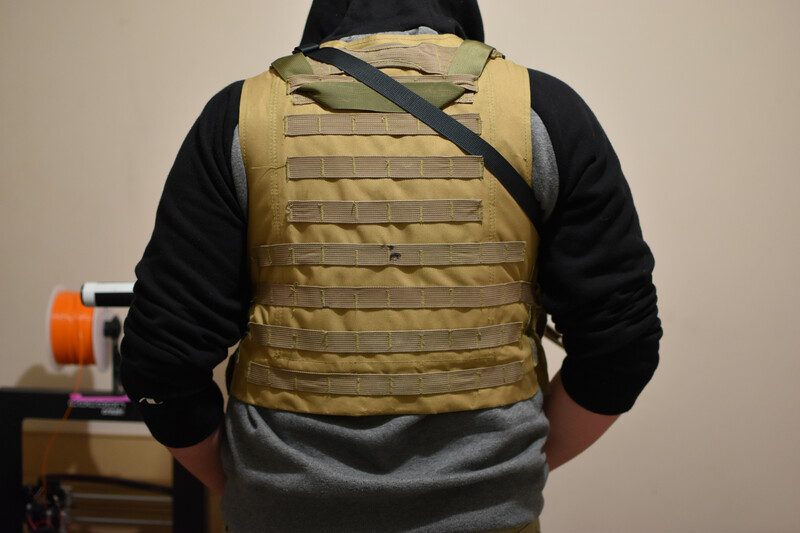 I don’t really have much to say on 2 Point slings, except that their main use is for long term transport across a back or on a single shoulder. The 3 Point that I use can be re-purposed as a 2 point for long-term, non-usage. 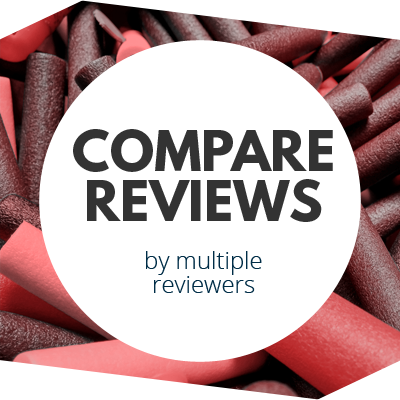 I find that in my particular Nerf applications they are nearly useless, because they are designed to provide long term carriage solutions whereas all the games I play are fairly fast-paced. 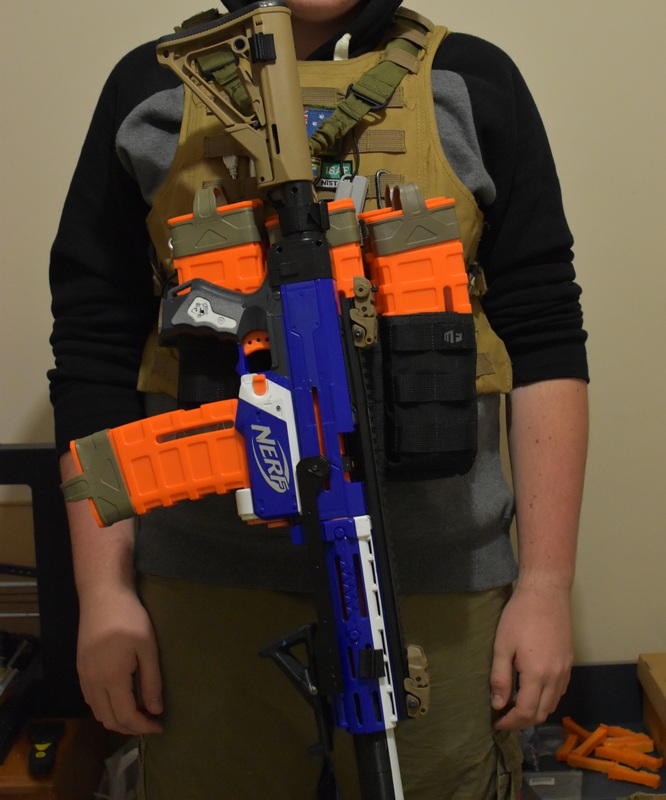 In the traditional, week-long style HvZs, they may provide more utility since you can sling a second, primary-sized blaster fairly securely (as seen below). Patrol Style is not my preferred style. I find it to be annoying to get a grip on the blaster to bring it up. It is also quite wide when resting unsupported by a hand. Drawing a secondary blaster from a hip or drop-leg holster is affected by this width, since the stock of the blaster rests in a position that is somewhat in the way of your hand as it brings up the secondary. As a side note, while both styles of 3 Point use restrict the ability to pan the blaster right without rotating the body, the Patrol Style does not restrict training the blaster left to the same extent the Muzzle Down Style does. Muzzle Down is my preferred 3 Point style. I find the resting position very comfortable, and like that it does not exceed the width of my body. Temstar did note that he found it harder to get the blaster into his workspace when running muzzle down as opposed to his preferred method of patrol, but now he does prefer the Muzzle Down approach. The retention of a 3 Point in either of the two modes is second-to-none. While some players ignore or shun slings, they are a useful asset in many situations and can be used to support virtually any play style. 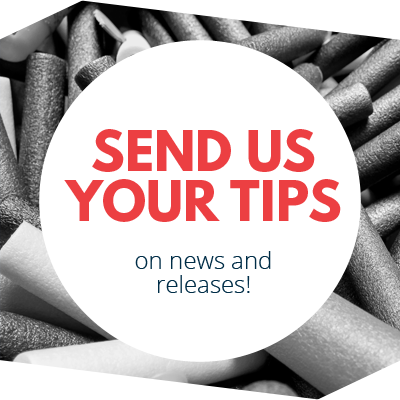 Simply contribute a useful topic to the Blaster Hub Forums within one week (7 days) of this article being posted. At the end of that week, we will randomly select 3 winners, and the winners will have their sling set mailed out to them. This competition is limited to 1 entry per person, You do not gain extra entries by posting multiple threads, but it is certainly encouraged. 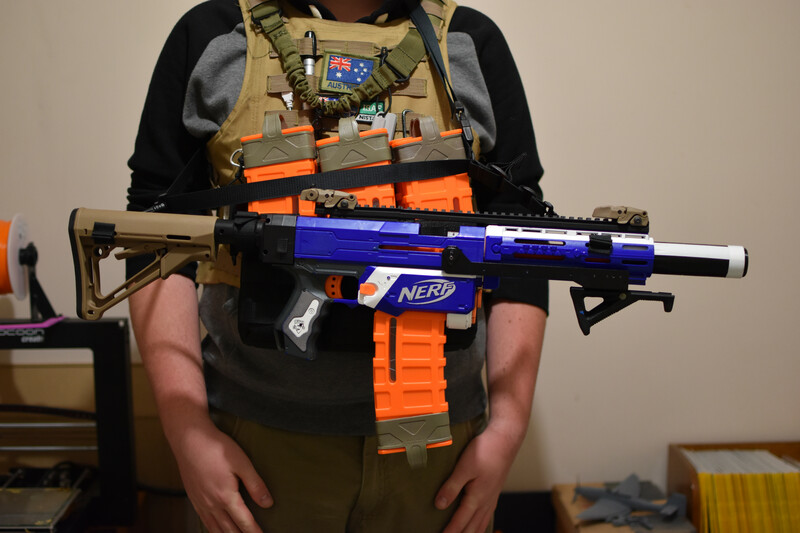 This entry was posted in Accessories, Contests and tagged Nerf Sling, Sling, Slings on July 12, 2016 by ThatRussianMerc.